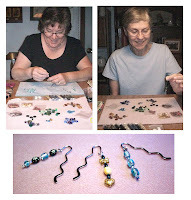 Pinelands Barb & me making beaded bookmarks on a Saturday afternoon. ...and did we ever have fun! We giggle at ourselves trying to pick just the right bead, even harder than picking the right fabric for a quilt. Thanks to Robin's generosity in sending me a little bead packie, we had many from which to choose! I'm glad my beads gave you 2 so much enjoyment!!! Wish I lived closer and I'd come over and bead with both of you for some friendship and inspiration! Those bookmarks are just the cutest things!!! Looks like it was a lot of fun. beautiful bookmarks...and the fellowship must have been wonderful!